2017 - what peppers are you growing? Re: 2017 - what peppers are you growing? That's too funny. Perhaps I should send them a pint of my hot sauce so they can up their game a bit. They may have to invent a new "Level" if that stuff was considered a 7th Level of heat. A couple months ago I brought a friend of mine a bottle of my sauce that I put in a Worcestershire Sauce bottle and one of his friends was wanting to try it. He let him shake a few drops into his palm and it took the guy about 3 seconds to start with the hiccups, which is a sign of how hot it is. He polished off his cold beer and told my friend and I we could keep that stuff. I just remembered I do have a pepper sauce recipe. I forgot about it because it is more of a relish then a pourable sauce. a quart of stemmed and capped hot peppers. I usually use tabasco (Hawaiian tabasco), super chili, and Thai peppers. The cleaned peppers are put in a blender along with a head of peeled garlic, fish sauce to just cover the peppers, and about a tablespoon of lemon juice. Pureed together and then put in clean jars. Ready to serve after flavors have blended about 72 hours. Thanks Gumbo for the sauce recipe. Now that is interesting as I love fish sauce, but no vinegar at all? I guess the fish sauce has enough preservatives. If you see glaring omissions or have must grow recommendations please LMK. Multiple listing indicate multiple plants. Number like (2) means doubled up in a container. Apple, when you overwinter, you supply lights, or do you have a place the sun can get to your peppers? As a rule I put them in southeast (back) windows which is the best sun-exposure I have. Once the leaves are completely gone from the trees in the back of the property, the winter sun rises directly east-south-east and will pour in these windows due to lower angle. But the sunlight is by no means enough, and I provide supplemental light of varying intensity. Green Room has a giant CFL bulb atop a torchere by the window. 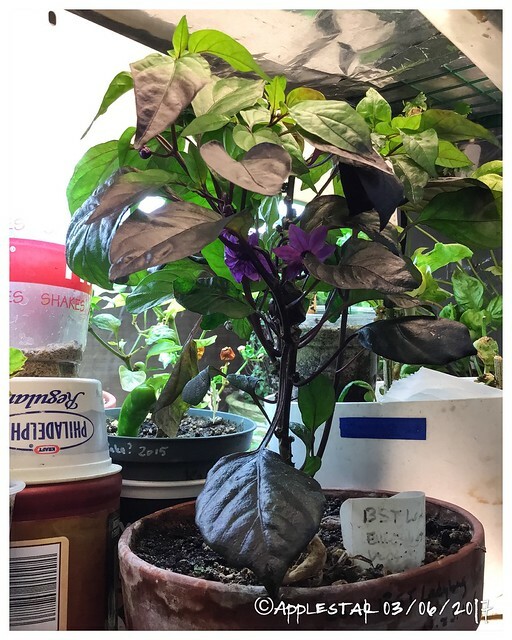 -- plants are on a low cabinet that used to be a TV stand, and I have one blooming/fruiting pepper sitting on the surface of a 2-3 gal pot of young avo. A couple of others in the interior of the room WAY under a hanging 4-tube 4 ft t8 shoplight -- surviving but not really blooming. Yellow Room has just one double CFL bulb utility light, but this is upstairs and warmer and the peppers are more lush with new growths that began earlier than the ones downstairs. I also put small plants under the seed starting shelves, some of which do not get much direct sun at all. My Winter Paradise shelves, however, is in a Northwest window and is jut now starting to receive some of the setting sun as the days lengthen and the sun sets more directly in the West... and then will set north of west as the season progresses. ...I guess I should add that I'm getting best results from WWL and CG, but the ones in the other areas are also blooming snd fruiting. It's better to have lights on both sides of the window -- The one side of the window without supplemental lights in the Yellow Room is a bit dark and growth can get elongated/less blooming. Overall, I have found the overwintered peppers to need LESS light than tomatoes to survive, especially in lower/cool temperatures, and less intensity to bloom and fruit. Considering tomatoes are easier to start from seeds and grow to maturity within the growing season, I find myself tending to want to overwinter more peppers than tomatoes, though I'm planning to resume my winter tomato trials next winter. You all make me feel pepper incomplete. I usually grow Purple Belle, Chocolate Beauty and a small fruited hot pepper of some kind. I tried several packs of old seed which haven't sprouted so I'm trying some others. I bought new seed for the Purple Belle, habanero, and poblano. There's not enough time to order any new super hots so I'll just go with whatever comes up, even if it's nothing. I'll have my new wish list made before the 2018 catalogs come out. Last year, a good friend sent me her last two vendor seeds of BST Ladybug. I was only able to get one of them to grow. It was REALLY slow to grow and was still tiny after a season in the garden, so of course I overwintered it. And it is starting to bloom. It's a hybrid with varied expression in the fruits so I'm really looking forward to finding out what I get. 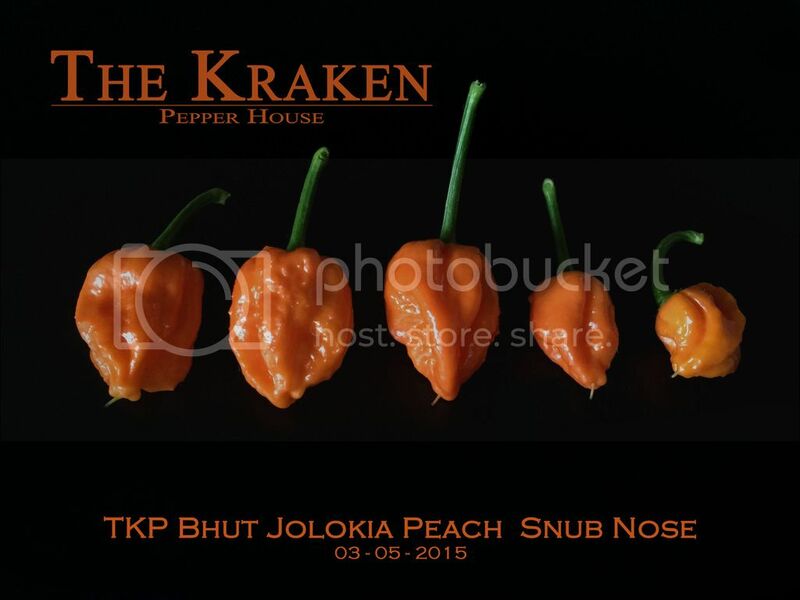 So I searched for "Peach Bhut x habanero"and came across a very interesting similarity with these, especially the smallest smoother blunt/snub nosed pods... mine might not be as wrinkled. My Winter Indoor Garden Not Peach Bhut is on the Cool Gang floor, which means it is in the low 60's except when the space heater is being used in the room by someone. I think mine still looks kind of peach colored. I wonder if the fruits will also change color or grow more elongated or wrinkled in the summer? TKP BHUT JOLOKIA SNUB NOSE - Officially not calling this a Peach anymore.. I'm going with Orange.. Here's some more of the TKP Bhut Jolokia Snub Nose (BJSN) - 2 of the pods got to the standard size and the others where obviously under as we head into winter.. The plant is still maintaining that size so I am confident its a true genetic trait .. I grow some superhots for fun but I would not attempt to eat them. Even handling a bhut jolokia bare handed made my hands burn for two hours and I started tearing and sneezing shortly after I opened the pod. It was dumb of me, I knew I should have worn gloves. From now on, maybe a mask as well. Gumbo, the pepper sauce doesn't need vinegar, the salt and oil in the fish sauce does the preserving. There is some lemon juice for acidity. The sauce is kept in the refrigerator. I don't leave it outside and it lasts for months. Another sauce we like to have is from Guam. Finadene. Is like tobasco on the table. It is always made fresh and is a must with kilaguen (BBQ meat, chicken, or seafood prepared with lemon). While it goes great with any grilled food, it can be put on just about anything you could put tabasco sauce on. 3-5 boonie (bird peppers) You can use any hot pepper you like. Guamanians like the fiery bird peppers that are around 80,000 SHU. The are similar to chiletepin peppers. Combine all ingredients in a bowl. Let it blend for a couple of hours in the frig before serving. The lemon or calamandin slices are sometimes floated in the sauce. It is finally warming up so I am starting to plant my milder pepper seeds. I'll wait until the night temps are in the 70's before I plant the super hots. My nights are around 68 degrees now and the days around 81-85. It feels hotter lately because of the Kona weather. The super hots germinate better when it is 80, but the milder peppers will germinate at 68 degrees. 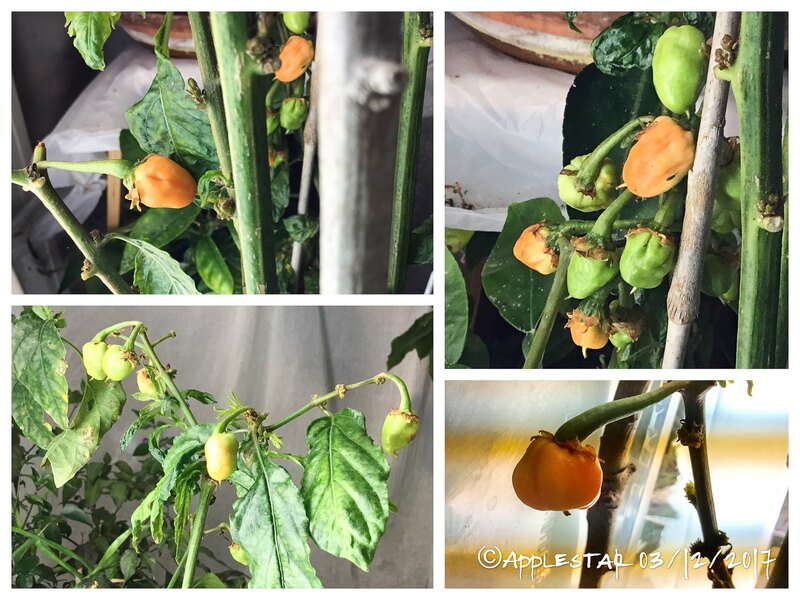 Apple, my peach scorpions are now about 1" to 4" tall...... I honestly don't care if they are true as long as the color is right.... I want a huge variety of colors. That said, my supplier said all seeds are true. Seed from 7 varieties have germinated. The exceptions are the oldest seed. I'm not really worried ... yet. It's a little awkward that they are all in 2 containers and the seedlings require what little light is available to them in the South Window. The seed yet to emerge benefits from the warmer temperatures in the kitchen. Everything goes back in there, overnight. If the sunlight is blocked by clouds, the cool South Window is a good place for the seedlings but not the seed. Competition between plants that get off to a quick start and those slow off the blocks can squeeze out the weak sisters in the coming weeks. I have had trouble with this in other years. I've little reason to be concerned that some won't have a good start so far. Earliest are tiny Thai Hots and their 4 day jumping the gun just gives them a benefit that they need with their big sister neighbors. I'm soon to do the 2nd sowing for everything and have really fresh seed for 2 of the laggards ... and had better use it! Seems like, with hot peppers, the paper towel germination method works best for me. Peppers have always given me trouble, although I like to think I'm getting a little bit better are starting them from seeds each year. This year, some of my pepper seeds were eaten by maggots -- fungus gnats I have to assume since there were some in the seed starting containers. I have never observed this before...maybe never noticed? Or this year's fungus gnats have new appetites. One variety I wanted to particularly grow -- Santa Lucia Island -- has been wiped out, but I started some more with more sterile seedzip/plastic spoonhead/sand DE method. Trinidad Scorpion Chocolate is starting to sprout -- one knuckling and another germinated upside down with root hairs on the surface so I gently scraped up some moist coir over the exposed seed root and tapped it down. Hopefully this second one will sprout tomorrow. Gardener123 wrote: Apple, my peach scorpions are now about 1" to 4" tall...... I honestly don't care if they are true as long as the color is right.... I want a huge variety of colors. That said, my supplier said all seeds are true. Looking forward to hearing more about your Peach scorpions. I need to know more fundamentals on growing peppers, please?